Autumn is upon us, and you know what that means… leaves! While they are beautiful when on the trees, they quickly become quite the hassle when they fall to the ground. Raking leaves can be strenuous and time consuming, but raking isn’t your only option! If you step out into the forest and dig down just a few inches into the ground, you will find dark, rich soil that likely looks nothing like the soil you see in your lawn. Why is the soil in the woods so dark and healthy? The leaves! Leaves make great fertilizer. Chemical fertilizers you buy at the store can be expensive, so turn to what may already be available to you, fallen leaves! Avoid wet leaves. Doing so will prevent your mower from clogging. Mowers typically have a harder time chopping wet leaves into small pieces, which means that your lawn will have a more difficult time absorbing the large pieces. 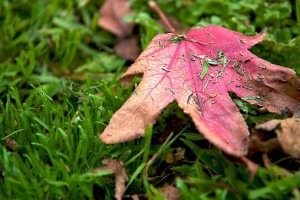 When it comes to dealing with the leaves in your lawn, it is important to act quickly. While a few leaves won’t harm your grass, a heavy layer can smother turf. When leaves pile up, they block sunlight and reduce air circulation, which can lead to a variety of conditions that will ultimately kill your grass. Additionally, the weight of the leaves can prevent your grass from growing properly, and wet leaves can cause your lawn to stay damp, which can cause the roots of your grass to rot. How do I know when to mow? Don’t let leaves pile up in your lawn. If you can’t see the lower half of the blades of grass, or if a third of your lawn is covered, it is time to mow. When you are finished mowing, the chopped up leaves within the soil should be dime-sized. Thatch is a loose layer of organic matter that can collect at the top layer of soil. It is typically intermingled with both dead and living material, just under vegetation, and right above the dark soil. Thatch can build up when organic debris is being produced faster than it can be broken down into the soil. While not all thatch is bad, an extensive thatch layer can cause many problems for your lawn. While some people worry that mowing down leaves will create thatch in their lawn, there is no need to worry because the microorganisms in your soil can easily breakdown leaf clippings. Can I use the leaves elsewhere? Chopped up leaves are great fertilizer for flower beds and gardens as well! Simply attach a grass catcher to your mower, and use the choppings as you might a fertilizer or mulch. Mowing leaves in your lawn is a great way to clean up your grass and fertilize your property. For more helpful lawn care tips and tricks, visit our blog, or contact Greener Horizon for a lawn consultation!